Haniffia Holttum is a genus of three described species of terrestrial gingers hitherto restricted to Peninsular Thailand and various localities in Peninsular Malaysia. With generic placement confirmed using nrITS, trn K and mat K plastid sequence data, Haniffia santubongensis S.Y. Wong & P.C. Boyce is described as a taxonomically novel species representing a new generic record for Borneo, to where it is endemic to Mount Santubong, Kuching Division, NW Sarawak, Malaysian Borneo. An identification key to all species is given and H. santubongensis is illustrated from living plants. Haniffia santubongensis is the fourth species of Haniffia so far described, and the first occurring on sandstone. Haniffia Holttum is a genus of three described species of terrestrial gingers hitherto restricted to Peninsular Thailand and various localities in Peninsular Malaysia. The three described species are all seemingly locally endemic. The type species, H. cyanescens (Ridl.) Holttum, is restricted to Bukit Tanga (Negeri Sembilan, Peninsular Malaysia), with a variety, H. cyanescens var. penangiana C.K. Lim, occurring on Pulau Pinang and Kedah. The most recently recognized species, H. flavescens Y.Y. Sam & Julius (Sam et al. ) is known only from Endau Rompin National Park (Johor, Peninsular Malaysia). The sole extra-Malaysian species, H. albiflora K. Larsen & Mood, is confirmed only from Nam Tok Chatwarin, Naratiwat, Thailand. A summary of the taxonomic history of Haniffia Holttum is presented by Larsen and Mood (). Fresh leaf material of Haniffia santubongensis was collected from the type locality, Mount Santubong. The type specimen with the spirit material was deposited to SAR. Genomic DNA was extracted using a modified CTAB protocol. ITS, trn K intron and mat K gene were amplified using the same set of primers as in Leong-Škorničková et al. (). PCR products were purified using GenJet PCR purification kit (Thermo Scientific, Vilnius, Lithuania) and sent for sequencing in forward and reverse directions at First BASE Laboratories Sdn. Bhd., Selangor, Malaysia. Sequences were edited, assembled and aligned using MUSCLE (Edgar ) as implemented in Geneious Pro v5.6.4 (Biomatters Ltd., Auckland, New Zealand; http://www.geneious.com; Drummond et al. ). Two newly generated sequences were deposited into GenBank under accession numbers KJ452785 (trn K/mat K) and KJ452784 (ITS), and combined with sequences included in Leong-Škorničková et al. (). When the placement of the new sequences was confirmed to fall within the Kaempferia Clade, then the final data matrix was reduced to include all the species in the Kaempferia Clade with Cautleya gracilis (Sm.) Dandy and Roscoea cautleoides Gagnep. selected as outgroups. Table 1 shows the list of species included for the final data matrix. The data matrix was deposited into TreeBASE (reviewer access URL: http://purl.org/phylo/treebase/phylows/study/TB2:S15361?x-access-code=f78126f9da891d3c6999dd52dfafdf77&format=html). Newmania orthostachys N.S. Lý & Škorničk. Newmania serpens N.S. Lý & Škorničk. Phylogenetic analyses were performed with PAUP*4.0b10 (Swofford ) for maximum parsimony (MP) reconstruction with all characters equally weighted. The most parsimonious trees were obtained with heuristic searches of 1,000 replicates with random stepwise sequences addition, tree bisection-reconnection (TBR) branch swapping, collapse of zero-length branches, with the multiple-tree option in effect, and saving up to 10,000 trees from each random sequence addition. The most suitable nucleotide substitution model for each of the gene regions was selected in jModeltest ver. 0.1.1 (Posada ) using Akaike information criterion (AIC). General time reversible (GTR + I + G) was the nucleotide substitution model selected. Maximum likelihood (ML) analyses were carried out using RAxML 7.2.6 (Stamatakis et al. ). Maximum likelihood bootstrap values were obtained by running 10,000 replicates. Bayesian phylogenetic analyses were performed with MrBayes ver. 3.1.2 (Huelsenbeck and Ronquist ). Markov chain Monte Carlo (MCMC) was repeated twice to assure parameter convergence. The MCMC algorithm was run for 2,000,000 generations with one cold and three heated chains, starting from random trees and sampling one out of every 100 generations. Convergence was assessed by using the standard deviation of split frequencies as convergence index with values < 0.005 interpreted as indicating good convergence. The first 10% of trees were discarded as burn-in. Remaining trees were used to construct 50% majority-rule consensus trees. In overall appearance H. santubongensis is most similar to H. cyanescens, sharing with that species a wide bluish labellum and semi-glossy fruits. However, H. santubongensis is clearly distinct from H. cyanescens by the lateral staminodes with an oblique bifid tip, the labellum distally notched (not deeply divided), and differences in labellum colouration and patterning (most notably the presence of a median yellow callus in H. santubongensis). Haniffia santubongensis represents a new generic record for Borneo where it is locally endemic to Gunung Santubong. 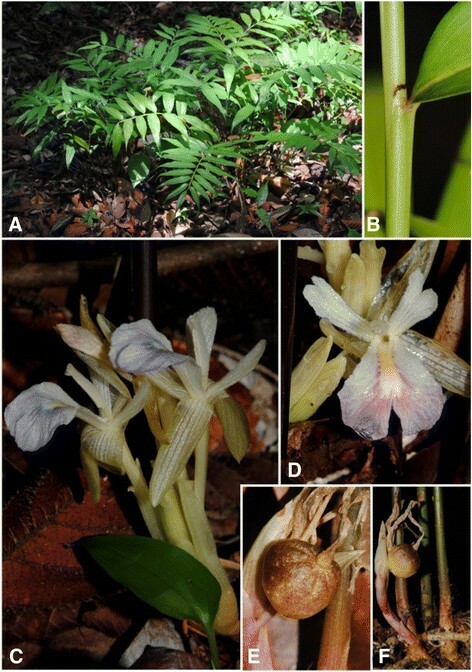 Combined with the three locally endemic species in Peninsular Malaysia and P. Thailand, it provides further compelling evidence that these Haniffia species, along with numerous other examples in families as diverse as the aroids, the palms, Rubiaceae Juss., and the genus Hanguana Blume, represent relictual fragments of the Riau Pocket phytochore (Ashton ; Corner ). The combined ITS-plastid dataset contained the new species and 19 species in the Kaempferia Clade recognized in Leong-Škorničková et al. () together with two outgroup species. The dataset comprises 2,115 characters: 1,682 characters were constant, 251 variable, but parsimony uninformative, and 182 (8.6%) were parsimony informative. The data analyses produced 32 shortest trees of length 633 steps with a Consistency Index = 0.7615 and Retention Index = 0.7729. The tree topologies obtained from three analyses are similar and consistent with the results from Leong-Škorničková et al. (). Figure 1 shows the partial tree obtained from maximum likelihood analysis. The new species is shown to be a sister taxon to H. albiflora and H. flavescens. Haniffia cyanescens is supported basally to the three Haniffia species. The new species of Haniffia differs by nine nucleotide substitutions (two in trn K intron and seven in ITS), an addition of 17 bps (trn K intron), an eight bp substitution (ITS), and seven bp deletion (ITS). Molecular phylogeny of the Kaempferia Clade (Zingiberaceae) indicating the placement of Haniffia santubongensis in the combined trn K/ITS analysis. Tree length = 633 steps, Consistency Index = 0.7615, Retention Index = 0.7729, Rescaled Consistency Index = 0.5886. Bootstrap numbers from Maximum Likelihood and Posterior Probabilities are provided on the branch. Haniffia santubongensis S.Y. Wong & P.C. Boyce, sp. nov. — Type: Malaysia, Sarawak, Kuching, Gunung Santubong, Summit Trail, just after F4, 04 44 12.1 N 110 19 30.6 E, 2 Sept. 2005, P.C. Boyce & S.Y. Wong ZI-22 (holotype: SAR; isotype: SAR (spirit), FRIM (spirit)) Figure 2. Haniffia santubongensis S.Y. Wong & P. C. Boyce. A. Plant in habitat. B. Detail of ligule; note the blackish colour of the free portion. C. Inflorescence. D. Single flower; note the bifid tips to the lateral staminodes and the yellow callus in the middle of the labellum. E. Infructescence. F. Detail of single fruit; note the semi-glossy slightly warty surface, and the prominent floral remains. Haniffia santubongensis most closely resembles H. cyanescens var. cyanescens (Negeri Sembilan) but is readily distinguished by the oblique-tipped, bifid lateral staminodes, and labellum distally notched (not deeply split) with a yellow median band extending from the entrance to the basal spur to the innermost extent of the lip distal division. Terrestrial, clumping herb ca 50 cm tall; rhizomes ca 10 mm diam., shallowly buried in soil; roots fibrous. Leafy pseudostem 5–25 per clump, closely spaced, composed of leafless sheaths and leaf sheaths, base ca 1 cm diam. ; leafless sheaths ca 6 per shoot, occupying the lower 1/3-1/2, reddish, glabrous, membranous on apex and margins. Leaves 10– 20 per shoot, sub-sessile, sheaths very short, to ca 1 cm long; ligule obtuse to almost truncate, slightly emarginate, ca 3 mm long, soon turning black, glabrous; petiole reddish; lamina narrowly elliptic to lanceolate, 8.5-15 × 2.5-3 cm, base cuneate, apex acuminate, acumen 6–20 mm long, glabrous, bright green, abaxially very slightly paler with deep green slender primary lateral veins. Inflorescences borne at base of leafy shoot, usually solitary, rarely two together, 5–7 cm long, with ca 5 flowers per inflorescence, peduncle to 3.5 cm long, reddish where exposed, otherwise pale green, basal sheaths 1–2, 1–2 cm, pink. Bracts boat-shaped, 15–25 × 6–10 mm, spirally arranged, membranous, reddish green, glabrous, each subtending one flower. Calyx tubular, 20–30 mm long, apex unequally tridentate, greenish, translucent, hairy at tip. Floral tube 36–70 mm long, greenish white, slightly glandular-hairy inside and out; dorsal corolla lobe elliptic, 20–26 × ca. 6 mm, membranous, greenish white with darker veins, lateral corolla lobes narrowly elliptic, 20–25 × ca 4 mm, membranous, greenish white with darker veins, glabrous. Lateral staminodes spatulate, apex oblique bifid, 15–20 × 4–6 mm, greenish white with darker veins, both surfaces covered with dense, greenish white glandular hairs. Labellum obovate, 21–25 × 10–14 mm, swollen at base where adnate to staminodes, apex distally notched, distal lobes curved downwards, white with blue staining, lobes suffused purple or dark blue-violet, centrally with a yellow median callus, upper surface covered with dense, white glandular hairs, lower surface sub-glabrous. Stamen white, covered with dense, glandular hairs; filament 5–6 mm long; anther 6–10 mm long; anther crest 2–2.5 mm long, apex bidentate, white. Style 46–54 mm long, glabrous; stigma cup-shaped, ca1.8 mm long, ciliate. Ovary 3-locular, ovules many. Epigynous glands two, free, linear, 2–2.4 mm long, yellow. Fruit a capsule, dehiscent, somewhat 3-sided, globose with prominent terminal floral remains, ca. 2 × 2 cm, semi-glossy brownish, heavily stained with reddish brown speckles on a cream base, exterior very sparsely warty, splitting longitudinally into 3 valves, valves fleshy, usually with 3-locules well developed. Seeds ellipsoid-obovoid, 6–7 × 3–4 mm, glossy brown, turning greyish-black, aril thick, white when fresh. Partially shaded, deep sandy peat podzols of ridge kerangas in Dryobalanops-dominated hill forest; ca 200–250 m asl. Haniffia santubongensis is known only from the type locality where it occurs as two separate, dense, populations. The species epithet is derived from the name of the type locality. Haniffia santubongensis is the fourth species of Haniffia and represents a new generic record for Borneo. This study was funded by Ministry of Education Malaysia through Niche Research Grant Scheme No. NRGS/1089/2013-(03). Fieldwork and research has most recently been under Research Permit No. NCCD.907.4.4(Jld.9)-69 and Park Permit No. 140/2013. We also sincerely thanked the two referees for their valuable comments. SYW and IHO carried out the molecular genetic studies, participated in the sequence alignment and data analyses. SYW and PCB dealt with the species description. SYW drafted the manuscript. All authors read and approved the final manuscript.